The first game of round nineteen saw bottom of the table Balwyn face Clubs Cup Champions Fitzroy. The Tigers raced out of the blocks early getting to a 3-0 lead, on the back of goals from Corey Sewell & Scott Rogan (2) giving them a healthy buffer. Balwyn would peg back the deficit with a Behrad Behzadpour brace either side of an Anthony Cassar strike seeing the game level at the half time break. Fitzroy turned the screws in the second half as Ben Monteleone got himself a goal with a classy finish, before Tal Galper smashed home a rebound to make it 5-3. Before Monteleone got himself another goal to open up the deficit. Harry Robotis got himself a goal as he made it 7-3 and the scores were blowing out. Sewell then got himself another to make it 8-3 as the Tigers were on a five goal run. Behzadpour then completed his hat trick on the break to cap off his fine display, but it would only be in vein with Rogan & Sewell both completed their hat tricks for a 10-4 lead. Behzadpour got himself a fourth to add some respectability to the scoreline but it was no more than that as the Tigers wrapped up a routine win. 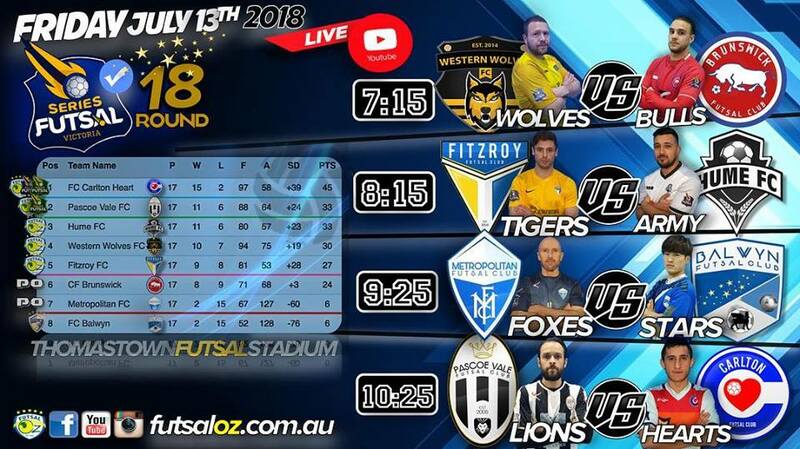 Next up we saw relegation threatened Metropolitan face a Western Wolves side with Series Futsal Australia in their sights. The Wolves started the stronger of the two and drew first blood through a Tiema Coulibaly strike following a one-two with Nathan Long. Long was the provider again as he headed the ball into the path of an onrushing Lokmen Ramadan who made no mistake in doubling the advantage. Metropolitan had a few chances snuffed out by Billy Atik, but they were few and far between as the Wolves were in control and added to their lead when awarded a five meter penalty, which Ramadan converted to give his side a 3-0 half time lead. The Wolves continued to apply pressure in the second half, and got another through a fantastic finish from Nathan Long which put the Wolves four ahead. Metropolitan hit back from a throw in as Khaled Ayache finished on the term to keep his side in the contest but still with work to do. The result was put to bed soon after as Long finished again from the right hand side for a 5-1 lead with time elapsing. Metropolitan got a late consolation as Alija Redzepovic ghosted in from a corner and finished but it wouldn’t count for much as the Wolves hold on to third place for another week. Next up we saw Brunswick who were looking to remain a chance at climbing out of the relegation zone as they faced another Series Futsal Australia hopeful in Pascoe Vale. After some initial resistance the Lions opened the scoring through a lovely finish from Joao Da Silva, but the joy was short lived as Michele Salvi answered back with a cracking finish to restore parody. Andre Caro would put his side in the lead for a second time with a thumping finish from a side ball, before A smart pass from Henrique Pimenta teed up Da Silva who made no mistake converting his second. Brunswick remained in the contest after a stunning goal from Sergio Tapia who beat his player and finished on his left foot to go into the half time break trailing 2-3. Pascoe Vale started the second half in the same fashion as the first as Pimenta converted his first of the game to again make it a two goal cushion. Salvi and Brunswick were not going away as the Bulls top scorer struck for a second time to again bring his side within one, only for the Lions to strike again as Pimenta finished at the back post for Pascoe to go two up again. A classy back-heel was converted by Salvi for his hat trick to set up a grand stand finish, but they would fall just short as Pascoe Vale take the points to remain a shot at an SFA placing. The final game of the evening proved to be the match of the round as we saw the top two sides in the league lock horns. With Carlton already crowned Champions, it was a big game for Hume as they were looking to hold onto second place for a Series Futsal Australia birth. Carlton would draw first blood as Hayden Razbocan opened the scoring. Hume would not be disheartened as they hit back through Hannah Shamon to level proceedings again. With both side having their chances, it wasn’t until late on that Ali Al Sharani popped up with a classy finish to give the Heart a 2-1 lead at the half time break. Early in the second half Hume restored parody as a Nejdett Sahin strike was deflected home by Ali Al Sharani to have the game on terms once again. Both sides had their chances but amazingly neither could find the back of the net and we ended the game tied at two and we were heading to the penalty mark. Ubeyde Cicek stepped up first for Hume but missed his chance, before Ernie Simsek made no mistake from the spot as he gave Carlton the lead in the shootout. Mario Petrovic then blew his chance as Abdirahman Ahmed was handed the chance to win it for Carlton. He did not convert the chance which gave Hume a life, Nejdett Sahin stepped up and rifled home his penalty but if Stephen Gustus converted his penalty the Heart would take home the points. Convert he did as Gustus sealed another three points for the Heart as they hand Hume a major dent in their quest for an SFA placing.